Although Myron was renown in antiquity for a bronze heifer so realistic that it could be mistaken for an actual cow, it is the Discus Thrower for which he is most famous. A Roman copy of a mid – fifth century BC bronze, it exemplifies the Greek sense of harmony and balance (rhythmos) which Pliny praises. Symmetria is the commensurability of parts, all in balanced and harmonious proportion, which is so well exemplified in the Discobolos. The athlete is in equilibrium, posed just before releasing the discus, the parts of his body in dynamic counterbalance. The head, however, seems almost to be a separate bust, so passive is its expression. In his Institutio Oratoria (Training of an Orator), Quintilian, who wrote in the first century AD, compares the rhetorician and the artist, and the distinguishing personal style that makes each unique. Interestingly, his scheme of the evolution of sculpture is different from that of Pliny. A stage of softness is attained by Myron, with a high point realized in the work of Polyclitus and Pheidias, after which decline sets in. What work is there which is as distorted and elaborate as that Diskobolos of Myron? But if anyone should criticize this work because it was not sufficiently upright, would he not reveal a lack of understanding of the art, in which the most praiseworthy quality is this very novelty and difficulty? 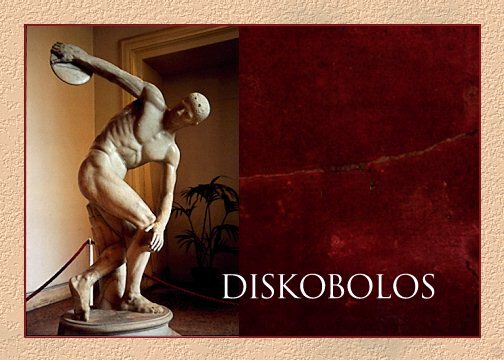 It is literary descriptions such as this that allow the Discobolus to be identified and attributed, of which the marble copy pictured above is the most complete example and the only one to correctly position the head (the copies in the British Museum and the Vatican, for example, depict the head facing away from the throwing arm). The small knobs on the forehead were used to fit a device in making the copy.